Originally published under the title "Obama and His American Critics on Iran's Anti-Semitism." 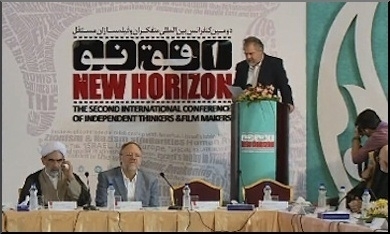 Iran hosted its second annual New Horizon Conference last October, featuring anti-Semitic ideologues and Holocaust deniers from around the world. Something unusual has begun in the Washington-New York corridor. Journalists and policy analysts have begun a critical public discussion about President Obama's understanding (or misunderstanding) of the significance and nature of the anti-Semitism of the Iranian regime. They are asking how his view on that subject affects prospects for a nuclear deal to stop the ayatollahs from getting the bomb. Insights about the history and nature of anti-Semitism that we historians have elaborated over the years are finding their way into the pages of several of our major newspapers and at least one important policy-related international relations journal. The President himself, apparently stung by criticism that his approach to Iran is facilitating rather than preventing its path to the bomb and that he bears primary responsibility for the tensions in American-Israeli relations, initiated this discussion when he recently gave an extensive interview to Atlantic magazine journalist Jeffrey Goldberg on May 21. Then, on May 22, the President spoke at Adas Israel, a Conservative Washington, D.C. synagogue whose congregants include many of the city's politics and policy leaders. There, the President spoke of "unbreakable bonds" and a "friendship that cannot be broken" between the United States and Israel. He said he was "interested in a deal that blocks every single one of Iran's pathways to a nuclear weapon — every single path." The President eloquently recalled the role American Jews played in the Civil Rights Movement and spoke of "the values we share." Many policymakers and analysts mistakenly believe that radical anti-Semitism is merely another form of prejudice. A week later, foreign policy analyst Michael Doran, whose excellent commentary about Iran I have discussed previously in this blog, wrote a "Letter to My Liberal Jewish Friends" in which he argued that the existence of shared values, though important, was not the key issue. It was, instead, the necessary criticism of Obama's policies towards Iran's nuclear program. The scholarship on the history of anti-Semitism hasn't yet had a significant impact on the policy discussions in Washington about Iran. Perhaps too many of our policymakers, politicians, and analysts still labor under the mistaken idea that radical anti-Semitism is merely another form of prejudice or, worse, an understandable (and hence excusable?) response to the conflict between Israel, the Arab states, and the Palestinians. In fact it is something far more dangerous, and far less compatible with a system of nuclear deterrence, which assumes that all parties place a premium on their own survival. Iran's radical anti-Semitism is not in the slightest bit rational; it is a paranoid conspiracy theory that proposes to make sense (or rather nonsense) of the world by claiming that the powerful and evil "Jew" is the driving force in global politics. Leaders who attribute enormous evil and power to the 13 million Jews in the world and to a tiny Middle Eastern state with about eight million citizens have demonstrated that they don't have a suitable disposition for playing nuclear chess." Well the fact that you are anti-Semitic, or racist, doesn't preclude you from being interested in survival. It doesn't preclude you from being rational about the need to keep your economy afloat; it doesn't preclude you from making strategic decisions about how you stay in power; and so the fact that the supreme leader is anti-Semitic doesn't mean that this overrides all of his other considerations." They may make irrational decisions with respect to discrimination, with respect to trying to use anti-Semitic rhetoric as an organizing tool. At the margins, where the costs are low, they may pursue policies based on hatred as opposed to self-interest. But the costs here are not low, and what we've been very clear [about] to the Iranian regime over the past six years is that we will continue to ratchet up the costs, not simply for their anti-Semitism, but also for whatever expansionist ambitions they may have. That's what the sanctions represent. That's what the military option I've made clear I preserve represents. And so I think it is not at all contradictory to say that there are deep strains of anti-Semitism in the core regime, but that they also are interested in maintaining power, having some semblance of legitimacy inside their own country, which requires that they get themselves out of what is a deep economic rut that we've put them in, and on that basis they are then willing and prepared potentially to strike an agreement on their nuclear program." Because Goldberg spoke vaguely about "European leaders," the President either did not have to or did not choose that moment to speak about his understanding of the role of anti-Semitism in the Nazi regime and during the Holocaust. That is unfortunate, because it seems—to this historian at least—that his grasp of the subject leaves something to be desired. 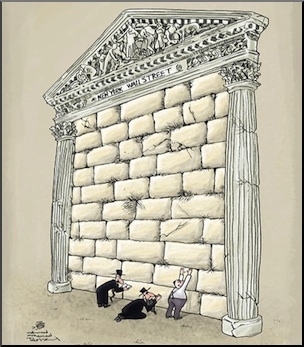 The winning entry in Iran's 2012 International Wall Street Downfall Cartoon Festival was, typically, anti-Semitic. The consensus among the numerous scholars who have worked on the subject is that for the Nazis, anti-Semitism was not primarily a form of discrimination or an organizing tool. It was an ideology that justified mass murder and did so not for the ulterior purpose of organizing others but because they believed that exterminating the Jews in the world would save Germany from destruction and eliminate the primary source of evil in the world. The extermination was carried out for the sake of these beliefs. Nor was this ideology at the margins of Nazi policy; it was at its center. The President's comments to Goldberg raise questions about whether the President fully or accurately understands the link between ideology and policy during the Holocaust. As I wrote in The Jewish Enemy, the Nazi leadership interpreted the entire Second World War through the prism of anti-Semitic paranoia in such a way as to interpret the war as one, incredibly, launched by "world Jewry" to exterminate the German people. Anti-Semitism then was a key interpretive framework that the Nazis employed to misunderstand the political realities of the time. If the President understands this dimension of anti-Semitism it was not evident in his interview with Goldberg. The President's comments suggest he misunderstands the link between ideology and policy during the Holocaust. Of course, Nazi Germany is gone and Hitler is dead. So a policy question facing any President of the United States now and in years to come remains the following: What is the place and the nature of anti-Semitism in the Iranian regime, and what impact does this ideology have on its foreign and military policy toward the United States and its allies, including Israel? For the first time in his six years in office, the President publicly acknowledged what scholarly observers of Iran, such as Tel Aviv University's Meir Litvak, among others, have pointed out for the past two decades, namely that indeed "there are deep strains of anti-Semitism in the core regime." Aside from the obvious rejections of Mahmoud Ahmadinejad's Holocaust-denial circus, this may have been the first time that any official of the United States government during the Obama years has said anything remotely approaching the President's remark about "deep strains...in the core regime." On the contrary, during this era of euphemism, even pointing to the regime's radical anti-Semitism could raise suspicions of "Islamophobia." Obama suggests that Iranian anti-Semitism will give way to practical interests. So President Obama's long-overdue acknowledgment of what has been obvious to informed observers for decades is most welcome. Yet, in the same sentence in which he acknowledged this inconvenient truth, he suggested that the ideological imperative would give way to practical and rational interests in maintaining power. In so doing, he diminishes the impact of the ayatollahs' radical anti-Semitism on the whole spectrum of Iran's foreign and military policy. There are many forms of prejudice and bigotry, and they are all twisted and ugly, but Jew hatred may well be the most damaging to the hater's ability to understand the world. Jew hatred takes the form of a belief that conspiratorial groups of super-empowered Jews run the world in secret, cleverly manipulating the news media and the intelligentsia to hide the truth of their control. Someone who really believes this isn't just a heart-blighted ignorant boor; someone who believes this, lives in a house of mirrors, incapable of understanding the way the world actually works. For Stephens, Mead, and historically informed contemporary observers, the radical anti-Semitism that lies at the core of the Iranian regime is not primarily or only a prejudice or, to use the more common term, a kind of racism that rests on distorted and false pejorative views of Jews. Rather, the ayatollahs' anti-Semitism is of the radical sort that in the past led both to an absurdly irrational yet deadly misunderstanding of world realities and to the Holocaust. It is an anti-Semitism that, in Saul Friedlander's terms, produced the era of extermination following an era of persecution. The views the President offered to Jeffrey Goldberg indicate either that he does not understand the nature of radical anti-Semitism, or does not believe that the ayatollahs are sincere in what they have written and said since Khomeini's exile writings in the 1970s and the assertions that he and his and his successors have repeated since coming to power in 1979. He appears to assume a moderation and pragmatism in Tehran that is belied both by that regime's core beliefs and its actions. The policy implications of these differing understandings of Iran's anti-Semitism are profound. If anti-Semitism is a form or prejudice and an organizing tool that allows for the kind of rationality we have witnessed in other nuclear powers such as the Soviet Union and China, then a policy of containment and deterrence of a nuclear Iran makes a certain sense. Michael Doran has made a cogent argument that this is, in fact, the policy that the Obama administration is pursuing. If, on the other hand, the anti-Semitism of the Iranian regime shares the qualities of irrationality that we historians of the Holocaust have documented in Nazi Germany, then a policy of prevention or preemption is essential because nothing could be worse than an Iran with nuclear weapons. As I have written before this is not a matter of a left and right. It is matter of how seriously one takes the Iranians at their word and how one assesses the connection between ideology and policy in this instance. Although President Obama's grasp of the history of anti-Semitism may be imperfect, his recent remarks signal an important shift in Washington: At last, the discussion of the nature and meaning of radical anti-Semitism has moved from the world of scholarship into the public debate about US foreign policy. The Iranian leaders may still insist on conditions that are so untenable that the President will be unable to present a deal to Congress by June 30th. If a deal does emerge, Congress will then have thirty days to examine and debate the agreement. Should that occur, I hope that the members of Congress will raise the issue of Iran's anti-Semitism not only as a form of prejudice but as a fundamentally irrational world view that is incompatible with a system of containment and deterrence. In preparation for that debate, the various members of the foreign policy scene in and out of government, in the think tanks and in the media, would be well advised to spend these early summer weeks reading the books and essays that we historians have written about the longest hatred as well as the above mentioned essays by journalists and policy analysts in order to gain an accurate understanding of its current manifestation in Teheran.